Since we’ve moved to Kota Kinabalu, I’ve been sick almost the whole time. Nothing serious, but bad enough that I’ve had no desire to get in the shop when I’ve had free time. I’m finally starting to get well. And today, my wife (out of the blue) suggested I go get some shop time. Yes, ma’am! So today I finished unpacking my miscellaneous boxes that arrived by mail and by boat. My shop’s fairly organized, but a couple shelves will really help a lot. I also finished my Japanese sawing trestles, which I put on my project list immediately after reading The Schwarz’s article on them. Now I’ll be better able to start work on my bench proper, which I think will also be a Japanese-style bench (again, grabbing the idea from reading The Schwarz). Next step will be to get a slab of wood (if I can) that is 4″x10″ and 5′ long. That’ll be my benchtop. I’ll be able to work with that slab on the trestles until I get some horses made that will support the slab at a better height. 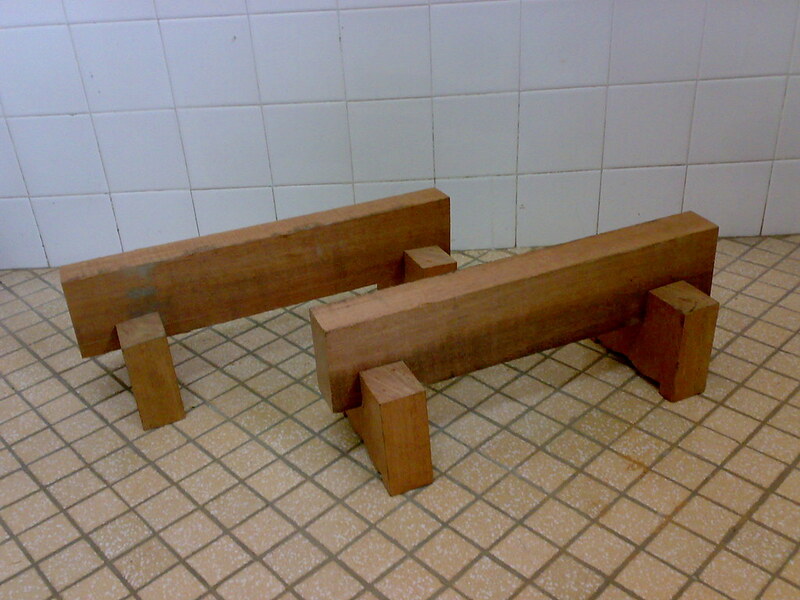 I think I might trick out my Japanese-style bench with some planing stops. One of the main things that this bench doesn’t give me, though, is a way to do dovetails. I think I’m going to make a simple heavy box with a vise on one side, and that box will mount to the bench. This will raise the work surface as well, which will be better for dovetailing. I might make my sharpening station work on that box as well. I’ll have to draw up a Sketchup of the bench in my mind, because I don’t know how clear this all is in print. Anyway, here is a shot of my trestles. Nothing fancy. In fact, I sort of avoided making them attractive on purpose. I’ve got too much to do to focus on fine craftsmanship on shop furniture. The wood is kapur, which is monstrously hard and really tough to handsaw; it also has an interesting silky kind of texture. Glad to hear you’re back in action. As an aside, what is intriguing me is your approach to minimizing the footprint of your shop. The sawing trestles seem to offer that advantage. Thanks for your comment! Yeah, I think that your observation is correct. And it’s intentional! My workspace is basically a rectangle about 5 feet deep and 7 feet wide. So I really need to maximize my workspace. Should I need a bigger benchtop, I can just lean my slab up against the wall and put a sheet of plywood on top of the trestles. In fact, I might just keep a 24″ wide sheet of thick plywood just for that purpose. But my guess is that 10″ should be sufficient for most of my woodworking tasks. I’ve done a moderate amount of woodworking while sitting on (tiled) bathroom floor: you’ll probably want a pillow or floor cushion — NOT one of your nice ones!!! — to sit on.